Before Parliament is prorogued next week, the Government is still hoping to force through its Higher Education and Research Bill during the “wash up” period. The Lords inserted many substantive and important amendments, several of which the government is minded to reject — but it may have to compromise to get the Bill passed. There is therefore a very narrow window of opportunity to influence the legislation. CHE urges everyone to use and adapt the template letter below to lobby their MP, and forward this post to everyone they know, asking them to do the same. This is literally the last ditch! As one of your constituents, I am writing to ask you to support all of the amendments made in the House of Lords to the Higher Education and Research Bill (HERB). This Bill is likely to be put before Parliament is dissolved. Your votes on this Bill will strongly determine my vote in the forthcoming election. 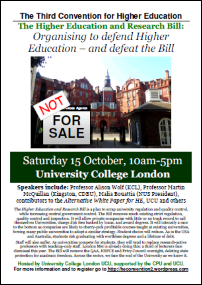 The HERB has been opposed by virtually every voice in UK Higher Education, as it would create a chaotic marketplace where untested, low-quality private providers can undercut and financially destabilise established universities, and would create a new, burdensome and entirely unscientific measure of teaching quality that will determine future fee increases. Clause 12 ensures university fees are not determined by the unscientific, untested “teaching excellence framework” (TEF). Clause 27 ensures the TEF must be rigorously scrutinised by statistical experts and not used to create crude rankings. Clause 47 improves quality checks for new higher education providers before they can become universities. Clause 49 provides safeguards to stop government regulators arbitrarily closing down universities. Clause 16 makes it easier for students to vote. Clause 90 excludes overseas students from the immigration statistics. 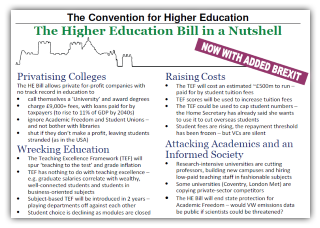 Further information on the amendments and why you should support them can be found here: https://heconvention2.files.wordpress.com/2017/04/che-he-bill-third-reading-briefing-for-mps.pdf. I urge you to support all of these amendments or, if the government refuses to accept them, to vote against the Bill. This entry was posted in HE BIll. Bookmark the permalink.